The 5-step foundation repair process is a method that foundation contractors have used for years. Before hiring a contractor to fix your foundation, which could prove costly, you’ll want to ask questions. It’s helpful to study what the procedure entails and find out about the methods used for repair. If you have questions, call HD Foundations. The repair process on foundations we use is performed in 5 steps for a reason, and it’s commonly done in Texas. 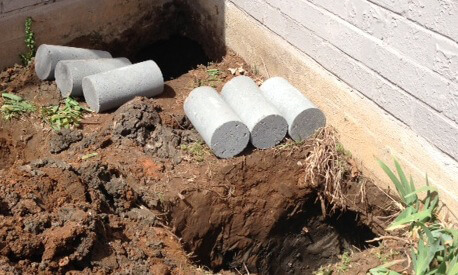 Unless you require interior foundation piers, our workmen won’t even need to enter your home. What Is The 5-Step Foundation Repair Process? It’s an operation used by contractors to fix foundations in the Dallas, Fort Worth, Arlington, TX area. This procedure is done on a step-by-step basis. By utilizing this particular system, a foundation repair contractor can minimize the cost of any repairs and be sure the procedure is performed correctly. Making a structure level requires experience. 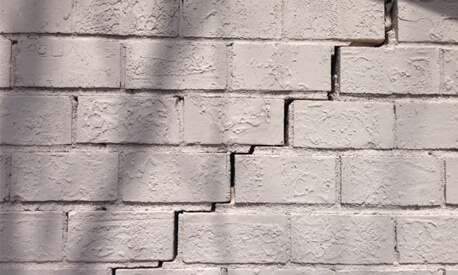 Since price is always a consideration, it’s a good idea to ask questions about what foundation repair costs. Charges can for performing the process can be as low as $2,000, or they can exceed $10,000. Fees for repairing some foundations can be priced at more than $15,000. The 5 steps can be very involved on some foundations. That’s why you’ll want to ask questions about costs before having your foundation restored. When using this particular process for making repairs, foundation contractors take the following 5 steps: (1) Inspect your foundation for damage. (2) Provide you with a contractor estimate for foundation repairs and any additional contractor services involved with the operation. (3) Obtain a structural engineer’s report on your foundation in as little time as possible, if required. (4) Restore the foundation on your house or commercial property. You’ll want to get more information about contractors in the Dallas, Fort Worth that repair foundation using HD Foundations’ 5-step process. (5) Clean up the job site when the procedure has been completed. Our system for making repairs yields terrific results. What 5 Steps Do Foundation Repair Contractors Take? Step 1: Prepping the job– The contractors at HD Foundations lay tarps down prior to making repairs, remove plants from around the foundation and disconnect specific utilities. By doing this, there is little mess. It pays to learn questions to ask a foundation repair contractor when they are using the 5-step process to fix foundations. We invite you to make inquiries concerning the methods we use. If there is anything about the repair process that you have questions about, please be sure to let HD Foundations. Step 3: Lifting the foundation – Concrete piers or steel piers are installed during the this stage of the 5- step process. If interior foundation piers are installed when making repairs, our workmen will need to enter your home. Exterior piers do not require gaining entry to your house. The structure will slowly be lifted by contractors. This requires that the foundation be elevated using hydraulic jacks and concrete piers or steel piers that the contractor installs under the foundation. Then, your house is positioned on top of the foundation piers in order to stabilize it. Your foundation repair contractor may also install steel shims under the foundation. The next stage of the operation involves something different, but that’s just part of the process of having house foundation repair. Step 4: Covering holes – While performing the 4th step, the experienced crew or contractor will make sure that all holes that were dug under or around your foundation are filled in with the soil that was originally removed. Remember, repairing concrete slabs and pier and beam structures are different, and some can be quite an undertaking. Step 5: Cleanup around the foundation once repairs have been completed – The final action involves removing tarps and debris and replanting the vegetation that was initially removed. When the foundation project is finished, your yard should be returned to its original state by the contractor. When your professional has finished all 5 steps involved with repairs, the process is complete. Fixing your foundation using this system unquestionably takes a little time, and most foundation contractors perform it using concrete piers or steel foundation piers. It’s usually a 2-3 day process, although sometimes repairs take longer. The 5-step procedure is something many foundation contractors can tell you about, along with what’s involved with restoring your foundation. They’ll also tell you how many foundation piers will be required when making repairs. Some projects are done very quickly. It pays to learn what foundation repair methods are used by contractors as part of the 5-step process. If you have concerns and want to learn more about it, contact the professional contractors at HD Foundations. Schedule a free estimate online today and find out more about the procedure. Or, if you like, simply give us a call.